Wow! Three Veggie books in one! Bob and Larry and other Veggie friends learn important lessons about doing what God wants, as zany knights, jolly vikings, and with a really big tuba! Ages 4-7. 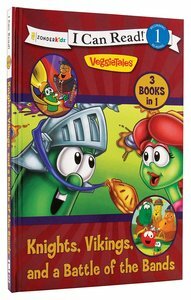 About "Knights, Vikings, and a Battle of the Bands (I Can Read!1/veggietales Series)"